2-0 (29) Jens Wahl, o.g. ¹ The match had been scheduled for a 3.00pm kick-off, but was delayed. Actual kick-off time was 3.07pm. Greece would continue their massive list of winter and spring friendlies with a visit of East Germany. Having lost successive home matches against Portugal and England, there had been an improvement, at least result-wise, last time around, when Norway had been beaten by 4-2. Now, just over two weeks later, the Athens Olympic Stadium would again be the setting, and yet again an appalling attendance figure would be registered. With crowds of 1000 and less for the matches with Hungary, Portugal and Norway, they were again in the 900s for this fixture. Manager Sofianidis had made a few alterations to his starting line-up, with Manolas, Bonovas, Tsiantakis and Kavouras prefered to Koutoulas, Oikonomidis, Maragkos and Samaras respectively. They would continue in 4-4-2. Visitors East Germany had started their qualification with a home win and an away defeat, and having already won impressively 4-0 in Egypt in a February friendly, this was their second of three winter fixtures before continuing on their road towards Italia '90. Two weeks later, they would invite Finland home to Magdeburg, with Turkey the visitors in GDR on April 12 in their next qualifying fixture. In Cairo, attacking midfielder Andreas Thom and forward Ulf Kirsten had shared the goals between them with two each. Manager Manfred Zapf would, like his counterpart, make four changes from the previous outing, with Scholz, Trautmann, Doll and Steinmann paving way for Schößler, Wahl, Halata and Stübner respectively. Far from strangers to playing with five across the back, this was indeed how the East Germans would take to the pitch in Athens, with the experienced Rohde as libero. 21 year old Dynamo Dresden starlet Sammer would continue in the centre of midfield, and with both Thom and Kirsten in more attacking roles, it was an exciting East German selection that Zapf had picked. Somewhat oddly, this was the eighth time since the start of the 1980s that these two had come head to head, and every time the occasion had been a friendly. East Germany had triumphed in all of their first five meetings, and their statistics read 6-0-1 ahead of this fixture. The only Greek win had come on home soil three years earlier,when they had outscored the East Germans by 2-0. On that particular occasion, one Thomas Doll had made his international bow, a feat also achieved by both Andreas Bonovas and Giannis Samaras for the Greeks. Just over six months prior to today, Matthias Sammer's first ever international goal had meant a GDR win by the slimmest of margins on home soil in their last head to head. Referee was 44 year old Italian Carlo Longhi, taking charge of his seventh international, with the highlights being his two qualification matches for the 1988 European Championships: a 4-0 win for Yugoslavia at home to Turkey and a 1-1 draw between the Netherlands and today's hosts Greece in Rotterdam. This is pretty much a straight forward typical Greek version of 4-4-2, with Manolas as libero and Kallitzakis as the central defender in front of him, with Tsaloukhidis mopping up in midfield, and with Nioplias as the orchestrator. Both flankmen, Bonovas on the right and Tsiantakis opposite, were also willing to contribute in playmaking. Among the two forwards, it was the taller Kavouras starting out to the right of centre, Saravakos more left bound. East Germany saw Rohde act as the spare man behind man-markers Lindner and Kreer. With Kavouras the more right-sided of the two Greek centre-forwards early on, this saw him come into combat with Kreer, but when the home strikers swapped sides, rather than follow their man across, this would also see Lindner cross path with Kavouras and Kreer with Saravakos. Zonally orientated man-marking, if that may be applied. Right-back Schößler and Stübner opposite would infrequently cross the halfway line. Wahl was the more defensive of the midfield three, and was often prone to appearing surprisingly far towards the left, with Sammer also sitting relatively deep, and with Thom more in a supporting role for the wide front two. Among the strikers, Kirsten would seek the territory to the right of centre, with Halata towards the left, both even participating inside their own half. It was indeed difficult to pinpoint the East German formation as it could be 5-2-3, 3-5-2 or, perhaps most likely, 3-4-3. At half-time, the visitors make a change when replacing midfielder Wahl with forward Doll. This sees a bit of shuffling about: Halata comes into the wide right position previously occupied by Schößler, who in turn comes into central midfield alongside Sammer. The latter had been central right in the first half, but appears as central left after the break, with Schößler to his right. Substitute Doll slots into Halata's left-sided forward role as the visitors retain their 3-4-3 formation. However, by the time Halata is replaced by Marschall, the scorer of the first East Germany goal had switched positions with Schößler, something which merely lasted a few minutes until the substitution. Marschall was a more natural central midfielder, and took up position next to Sammer. The home side had replaced libero Manolas with Koutoulas at half-time. A straight swap. During the second half, Koutoulas himself would be replaced with Vakalopoulos, probably due to injury, so the second Greek substitute would be their third libero for the afternoon. As Borbokis replaced Kavouras, it was another like for like change, and that was also the case as Maragkos appeared in place of Tsiantakis towards the end. It is another afternoon kick-off in the Greek capital as the vast collection of empty seats welcome the visitors from East Germany. The away side had done very well in their previous friendly, annihilating Egypt by four goals to none away from home. There had been a few changes in East Germany's line-up since Cairo, and it was interesting to see how they would take to the field. Often influenced by their West German counterparts tactics wise, one could have been forgiven for thinking that manager Zapf would line his players up in something akin to 3-5-2. As for the hosts, they were right in the middle of this pile of winter and spring friendlies, something which probably would have contributed to the attendance figure appearing so scarce. The national team had only ever once made it to the finals of a major tournament: In 1980 they had qualified for the European Championships in Italy. The national team was hardly held in high regard; interest appeared worryingly low. Fans instead chose to flock to the stadia whenever the major domestic teams were playing. In their most recent outing, Greece had enjoyed some success in quick turn-overs from defence to attack against Norway. In the East Germans, they were expecting to face an opponent sitting relatively deep. It quickly became evident that the visitors were operating with Rohde as libero, as he was sitting deeper and behind the two other central defenders, both of whom were attending to each their Greek striker: Kreer, to Rohde's left, stuck to the rather imposing figure of Kavouras, whereas Lindner appeared to keep a watchful eye on the home side's most internationally acclaimed player: skipper Saravakos. As had been the case against the Norwegians, Saravakos, albeit mobile, would stick predominantly to the left hand side of attack, as he would looking to engage both left-sided midfielder Tsiantakis and left-back Khatziathanasiou in the build-up of attacks. His forward partner Kavouras was a much more direct player who seemed to relish any ball into space, though the home side did rarely attempt to make use of such tactics. Kavouras' lack of pace made sure his marker Kreer was able to keep up with him at most times, and he would only have one attempt at goal all match: A first half shot well over the bar from inside the area after a pull back by Apostolakis. The East German formation was rarely encountered in European football. Zapf wanted his two main strikers Kirsten and Halata wide, so that they could pull the Greek central defence wide and thus pave way for Thom, who was operating just behind the pair. Behind Thom, in central midfield, was the flame haired Sammer, who more or less single-handedly was in charge of directing East German traffic. Sammer did have debutant Wahl alongside him, but Wahl remained a relatively peripheral figure throughout the half, also at times making use of the left hand side. Stübner was the designated left-sided midfielder, though he was not your typical pacey winger who would take on and beat his full-back. Instead, Stübner offered a lot of running and sheer dedication. Wahl at times seemed modest, and would from time to time rather let Stübner come into his position to participate in play. However, there was little doubt that the two players whom Zapf wanted to be on the ball were Sammer and Thom. Particularly the latter seemed at home when he could drive forward with the ball at his feet. Since their last outing, the Greeks had brought back skillful midfielder Bonovas. He had replaced Oikonomidis at the right hand side of midfield, thus ousting further the element of height in their side. They would need to outwit and outrun the taller visitors, something which Bonovas on his day was capable of contributing to. In Tsiantakis opposite they had a player of a somewhat similar nature, and also playmaker Nioplias in the centre was hardly someone you'd wish to be your only accomplice in the trenches. It was good, but hardly a coincidence, they had the dependable Tsaloukhidis to shore up midfield from his deep-lying role. However, Tsaloukhidis was also a threat when coming forward for attacking set-pieces, and with a decent frequency he would get his head to a ball into the penalty area. It was no fluke that he had already scored thrice in five winter friendlies so far. Tsaloukhidis' position at the rear of the Greek midfield also ensured he would come in contact with Thom from time to time, and it would be a battle that the former would relish more than the latter. The first opportunity of the game comes the visitors' way nine minutes in, after Nioplias had fouled Stübner in the left hand channel, almost 30 yards from goal. Central defender Lindner possessed one hell of a shot, and had a go from that distance. His effort went straight at Oikonomopoulos, but the 'keeper could only parry the ball which fell into the path of Halata, who tucked the ball home at the second time of asking. However, the Italian referee had spotted an infringement against the goalkeeper, something which was not all too easy to detect via TV pictures. Oikonomopoulos had gone down clutching his head, but it was probably more an act of trying to win the ref's sympathy rather than him being in actual discomfort. The debutant had been robbed of a goal. The workrate of the visiting strikers seemed quite impressive, as neither Halata nor Kirsten were shy to come all the way back to their own byline to try and dent the home side from getting crosses into the box. It does appear that Thom is the one trying to save the greatest amount of energy, reserving his efforts for when he is on rather than off the ball. He does have moments of brilliance, as he rides tackles in the centre, but as the two other forwards are often found quite wide, he has few options of trying to thread a pass through the centre. Sammer is not someone to make a run from the deep, and Wahl has little to offer apart from at set-pieces, where his size sees him pose something of a threat. However, he cuts a fairly nervous figure for most of the opening 45 minutes. As the opening half is approaching its midway point, Greece go ahead: Nioplias does an excellent job in winning a tackle against Thom just inside the Greek half. Again, the East Germans' advanced playmaker had seemed a bit half hearted, and you would not all too often see Nioplias even attempt a tackle. This effort, though, he executed with perfection, something which gave him time to pick Bonovas out with a forward pass. The diminutive right winger was in a central position, spotting Saravakos' run just ahead of him, as his forward was attempting to leave his marker Lindner in his trail. No one was closing Bonovas down, something which seemed to have upset Rohde, the big East German libero, who came to try and approach the on-rushing Bonovas to perhaps get a tackle in. However, Rohde is left in no-man's land as he makes his forward push, and the home #8 can pick out Saravakos, who has managed to shake himself loose from Lindner's attention, with a quick forward pass. Rohde tries desperately to block the pass, but only contrives in getting a touch which sees the ball spin into the air and continue into the path of the forward. Saravakos, when sniffing goal, would need no second invitation to have a pop: Impatiently waiting for the ball to drop down at his feared right foot, he even strikes it before it hits the ground, and his rapid finish leaves Müller with no chance, the ball rolling into the back of the net right along the ground. It might have seemed a simple way to execute a goal, but it was the class of Saravakos that made it look so. The few minutes after the home side had taken the lead belonged to Nioplias. The Greek midfielder, equipped with a fine left foot but a rather fragile frame, would be given the ball by his lesser peers, and it would be Nioplias' task to try and carve out an opening. As it were, he would try to look for the intelligent movements of Saravakos ahead of him. Saravakos' marker Lindner had already learnt what a tricky customer the striker can be to control. As for Nioplias, the East German midfield were not man-marking, and so he was relatively free to operate according to preference. Behind him, either the full-backs or libero Manolas, himself not foreign to spray balls forward to the right hand side into the path of right-back Apostolakis, would look for Nioplias, and once the Greek number 10 had found a bit of space, he would typically seek out Saravakos. 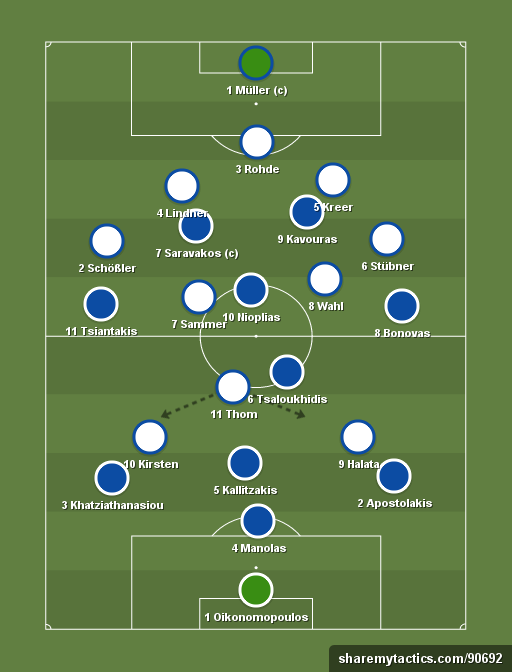 They were sound going forward, Greece, though their midfield could well be exposed when in need to defend, as neither of Tsiantakis, Bonovas nor Nioplias favoured this exercise much. One Nioplias diagonal pass into the right side of the penalty area saw him find Saravakos bereft of his marker yet again, though this time his angle was not right, and his first time finish went into orbit. The visitors, though, seemed momentarily out of it, and were struggling to get a foothold in the game. It would get worse for GDR: Before 30 minutes were played, the home side had increased their advantage. A free-kick had been awarded out on the right hand side, some 25 yards from the byline, and Saravakos would swing the ball right-footed into the area. He had aimed at Tsaloukhidis, who would usually cause a stir with his presence when attacking a set-piece, even if a few of the visitors' players were taller than him. Tsaloukhidis possessed a fine jump, yet his qualities in the air wasn't needed on this occasion. The ball had seemed to come down favourably for defender Lindner to head away, but for whatever reason, possibly for the fear of scoring an own goal, he pulled out of connecting at the last fraction of a second, thus leaving team mate Wahl with no chance of escaping the ball's path. As the ball reached Wahl's head, there was nothing the unfortunate debutant could do to duck out of the way, only seeing the ball make a loop and end up in the back of the net with Müller well beaten. 2-0. The home side seem content after notching their second, and the visitors come more into the game, having a greater share of possession. Yet they are unable to carve the home side open. There's precious little running off the ball from the away team, as Thom seems uninterested and Kirsten's usually followed in his tracks by the burly Kallitzakis. Sammer's usually found if not inside the centre circle, then certainly not far away from it, and it is right flank Schößler who seems the most inventive during this period. The next opportunity will still come East Germany's way, and it should have brought a goal. Indeed, it did bring a goal, only the officials failed to spot it: Stübner got to the byline on the left hand side, and his low cross seemed to find Kirsten, who under pressure from Kallitzakis can only hit thin air. Next in line for the visitors is debutant Halata, whose left-foot effort smashes into the crossbar and drops down clearly about three inches beyond the goalline. No goal given, though, to the forward's disbelief, and Oikonomopoulos can gratefully clutch the ball to his chest and breathe a big sigh of relief. It was a warning to the home side that they could not allow themselves to doze off, as the East Germans were ready to pounce. For the second time in the first half, the Lokomotive Leipzig front runner had been robbed of a goal. Only about a minute from the half time whistle, Greece come perilously close to increasing their lead as Tsiantakis smashes a 28 yard effort from his right boot off the crossbar. In fact, the surprise shot almost struck the angle of the bar and the post, and it occured after a quick attack initiated by the increasingly dominant Nioplias and skipper Saravakos had been pushed out into the winger's path following a sliced clearance by Stübner. Tsiantakis had spent most of the half engaging in tussles with Schößler, who was reluctant in letting him disappear out of sight. However, on this occasion the East Germany right flank was nowhere to be seen, and Tsiantakis' effort saw him bury his head in his hands. The visiting 'keeper, Müller the captain, had got a faint touch, and had he not the ball would have crept in. As it were, the resulting corner was no threat and the 'keeper could gather the ball from the air. Nothing more would happen before the Italian referee blew his whistle for half time, but it had certainly been an eventful second part of the opening period. As the teams reappeared onto the pitch for the start of the second half, both managers had made changes. For the home side, it had most likely been clearified even before kick-off that liberos Manolas and Koutoulas would be playing 45 minutes each, and so the latter had come on for the former. It is worth noticing that both Manolas and Koutoulas were playing for AEK in the Greek capital. One could perhaps have been forgiven for thinking that Manolas was the AEK libero due to his superior age over Koutoulas, but in fact it was the latter who usually performed in this role for the club side. With the international team, though, they would in fact never start the same match. By the time their respective national team careers had come to an end, Manolas had featured an impressive 71 times, Koutoulas a mere 11. In the visitors' midfield, the unfortunate Wahl had been replaced by the aspiring talent of Dynamo Berlin forward Thomas Doll, who, at 22, was already making his 16th appearance for GDR. This would lead to changes in positions, as Doll would slot into the wide left striker's role previously occupied by Halata. Alongside Sammer in central midfield would come Schößler, who had been an enigma along the right hand side during the opening 45 minutes, and in Schößler's wing back position would come the equally interested Halata, another East German who had had an unfortunate opening half. From an outsider's point of view, the decision to put Schößler into central midfield appeared a baffling one, considering there had been other options available to Zapf. Stübner, for example. Would he not have seemed like a more apt choice? For most of the game, he would seem quite wasted along the left hand touchline. Given the amount of space Greece had been given in central midfield during the last 20-25 minutes of the first half, one would have thought that Zapf's idea was to close Greek playmaker Nioplias down early on. And they appear to be in confident mood early on despite the two goal deficit, the visitors. They are the ones mounting the first purposeful attack of the second period when Schößler darts up along the right hand side, despite now appearing as a central midfielder, and puts a cross in for Doll to get to at the near post. The substitute's flicked attempt goes just over Oikonomopoulos' goal, but it did show that East Germany were bent on setting the record straight, clearly displeased at being two goals behind. To address their midfield shortcomings, the East German manager had been contemplating to bring on Lokomotive Leipzig's Olaf Marschall, but another Schößler injection of pace to see him run into the right hand side of the Greek penalty area and get to the byline, would make Zapf hesitate: As Schößler angled his pass back into the area, the hosts were unable to clear their lines, and in something of a melee it would be Halata who got lucky on the third time of asking as he managed to poke the ball home high into Oikonomopoulos' net. The 'keeper had sold himself short on the original cross, and was off balance as the forward-turned-midfielder reduced the arrears. 2-1, and with 35 minutes still to play, it did appear that the away side were making Greece feel the heat. Rather than turning to Nioplias for inspiration, it was Saravakos who was the home side's muse after the break with his clever runs, his little turns on the ball and his varied passing. He seemed all the more important to Greece now that the visitors were doing their utmost to pin them back. In Kavouras, Saravakos did not seem to have a lot of help up front, as the big forward was relatively easily contained by the East German defence. Greece were always looking at their most dangerous when they could break with pace, and they did have a good few players with this kind of ability in Nioplias, Tsiantakis and Bonovas, in addition to the captain. And break they needed to do, as it was the visitors who were running most of the show in the opening quarter of an hour after the break. Kallitzakis had brought Kirsten down on the edge of the area, and it seemed a decent opportunity for GDR to test Oikonomopoulos. However, Thom's eventual strike would be blocked by the defensive wall, and Doll's follow-up was also cleared by the home defence. Just as the visitors were starting to turn the screw on Greece, Saravakos struck with a wonder goal to increase the home side's lead to 3-1. Tsiantakis had spotted his captain make a run just to the right of centre and outside the East German penalty area, though the winger's pass seemed to have been played slightly behind Saravakos. In an exceptionally clever bit of opportunism, though, the Greek number 7 swivelled and hit a half volley on the turn which bounced just before Müller's goal and crept in at the far post. It was definitely a goal a top marksman worthy, and a big blow to the East Germans' chances of getting back to level terms. The move of putting Schößler into a central midfield position had not backfired, but the visitors were probably less balanced with the attack-minded Halata in a wing-back position, and so Zapf switched the pair not long after the third home goal. The second midfield slot, the one next to Sammer, did seem to cause the manager some concern, so it was only a matter of time before he saw fit to make another substitution. Sammer was doing alright, but was hardly equipped with an exceptional change of pace, he would at times look laboured in comparison to the quick and nimble midfielders of the home side. However, he was putting himself about in challenges, and was giving a decent enough account of himself. Thom, on the other hand, did not seem very interested, and would generally not pose much threat to the Greek defence, where he would either come into combat with Tsaloukhidis or with central defender Kallitzakis, who was operating well ahead of libero Koutoulas. Kallitzakis, though, would usually not stray too far off Kirsten, and so it was the Greek number 6 who would more often clash with Thom. Saravakos continued to be a big presence up front for the home side, who were in the second half deliberately playing less through midfield, as Nioplias was no longer seen with a lot of space around him. Without much aid from the stationary Kavouras, he kept harassing the visitors' defenders, and he gave both Lindner and Kreer a run for their money. At the back of the East German defence was libero Rohde, and there were times when he did not seem to communicate too well with the two man-markers, thus leaving their defence stretched and surprisingly open at times. One would have thought this a solid backline judging by the players in action, but as a unit they did not have a fruitful afternoon. Clearly, they worked better when put under more constant than sporadic pressure, and they did not have the pace to keep up with Saravakos nor the attacking Greek midfielders. In another fine Saravakos inspired move some 19 minutes into the second half, it is right-back Apostolakis who has a shot deflected over Müller's bar from 20 yards. One does not see much of East Germany libero Rohde as an instigator of attacks. He will typically stay safely locked well inside his own half, usually leaving to either Kreer or, more frequently, Lindner to move the ball into midfield, where Sammer would often take over the role as distributor. In playing with wide strikers, there were usually options along the flanks, although the Greek full-backs were doing quite well in keeping both Kirsten and Doll attended to. As already mentioned, Kirsten would even have the imposing figure of Kallitzakis breathing down his neck at times, and so was unable to influence proceedings much. Halata was having a more quiet second half than he had been in the opening 45, and the next thing to happen was that Zapf decided to take him off and finally bring on Marschall, who had been prepared to appear right before Halata had scored for 2-1. With 66 minutes on the clock, it was time for the change. Andreas Thom would go on and be a major international star for years to come, and having had a quiet afternoon all of a sudden burst into action just after the introduction of Marschall. He played a couple of triangles with Sammer and Doll respectively, and the latter saw him set up to have a shot from a full 25 yards. He struck the ball as sweetly as anything, and it nestled into the back of Oikonomopoulos' net. Perhaps the 'keeper had been unsighted? He did not get near the ball, and could also well have been badly positioned and even wrong-footed. As it were, the visitors had once again cut the home lead to just one goal, and with almost 25 minutes still on the clock, there was enough time to complete a comeback. There is no end to goalmouth action at this point, and almost immediately after kick-off, Khatziathanasiou knocks a long ball forward for the enigmatic Saravakos, who is adjudged to have been fouled in the air by Lindner just on the left-sided angle of the East Germany penalty area. It is the skipper himself who stands over the ball for the free-kick, and despite the awkward angle he decides to have a go. Saravakos' effort evades the defensive wall and smashes into Müller's right post, with Kreer able to dent Nioplias a goal from the rebound as he throws himself in front of the ball to block it away for another Greece corner. What a strike again from the Panathinaikos ace, who was having a blinder. Müller, held in high regard by his contemporaries, stood little chance of preventing Saravakos' many efforts. And next? We are back up the other end, where a Doll left wing corner is flicked on by Marschall at the near post for Sammer to head at goal across the six yard box. Oikonomopoulos does well to prevent a goal by parrying the ball away for another flag kick. Will we ever be allowed a breather? Gradually, the blazing inferno that is the opening 20-25 minutes of the second half slows down. With the introduction of another physical performer in Marschall, the East Germans are once again looking to get the upper hand in midfield, and they restore Sammer to his original central right position, with Marschall playing to his left. Schößler had already been restored to his wing-back role, and would see the game out in that position. The pace dies down somewhat, and the frequency at which chances come at both ends subsides. In bringing on a less mobile yet more solid midfielder, Zapf had managed to bring to an end the extreme free-flow of the game, a free-flow which had seemed to benefit the visitors. Yet, with both Thom, despite his excellently taken goal, and Kirsten having off-days, the threat level in front of Oikonomopoulos seems to wear off. Doll has the potential to do to the Greek defence what Saravakos has done down the other end, and he is both agile and mobile, but too often comes into far wide positions, and so does not pose much of a direct threat himself. And Greece defend well, in particular in central areas, where Tsaloukhidis all match is having the upper hand on Thom. Having replaced Manolas at half time, libero replacement Koutoulas has to come off ten minutes from the end. As he is running towards the sidelines to be replaced by Vakalopoulos, he appears to have a slight limp, so injury is probably the cause of this substitution. Vakalopoulos had appeared as libero also during the Greeks' previous game against Norway, and would resume these duties for the remainder of this match. With Kallitzakis just ahead of him, the home side's central defence now carried a lot of hair, as both Vakalopoulos and Kallitzakis looked like they could have been picked from just any glam rock band that was grazing a concert venue at this time. Only two minutes after Koutoulas' exit, manager Sofianidis decides to replace misfit striker Kavouras with Borbokis, the PAOK forward coming on for his sixth international. He was capable of performing as a wide man, but would here be a direct replacement for Kavouras, adding further mobility to the Greek forward line, where by now Saravakos was beginning to tire after an afternoon full of running in order to stretch the East German defence. With only a few minutes remaining, and just before Greece make their final substitution when taking off the inspirational Tsiantakis and replacing him with the more defensively natured wide man Maragkos, East Germany hoist libero Rohde into a centre-forward role. It is last chance saloon for them as they try to reach the defender-turned-forward with high balls into the area, and on one occasion he is able to cause stir to such a degree that Kirsten can have a shot in from the edge of the box, though his effort goes straight at Oikonomopoulos. It is Kirsten's sole attempt on goal all afternoon, and in a game where defending had generally left a lot to be desired, it would give an idea about Kirsten's lack of contribution. He had been relatively closely shadowed by Kallitzakis most of the game, but had done little in attempt to shake himself loose from his man. And so the game comes to an end with a fine scalp for the hosts against visitors of fine potential. After a fairly mundane opening 20 minutes, the hosts score twice before the break with their captain Saravakos the great source of inspiration. He notched the first and then assisted for Wahl's unfortunate own goal, and he would give the East German defence a run-around all afternoon. Halata had been unlucky to have an early goal chalked off and then again when his effort rebounded off the bar and across the goalline, although the officials failed to award a goal. The second half would continue in much the same vein as the first had ended, with chances galore at both ends. The visitors felt they had done well to get back into the game through Halata's poked finish, but shortly after the omni-present Saravakos restored Greece' two goal cushion. Despite a wonderful strike by Thom for 3-2, the hosts, who were always dangerous on the break, managed to hold on and also struck the woodwork for a second time through Saravakos' effort from a free-kick just outside the penalty area. Just before half-time, Tsiantakis' opportunistic shot from distance had been fisted onto the angle of the post and the crossbar by Müller. Eventually, the game slowed down for the final 20 minutes, and Greece had claimed a noteworthy win.